Judo (Japanese: 柔道, jūdō; "gentle way") is a martial art and combat sport, which originated in Japan. Judo, now primarily a sport, is a system of unarmed combat. The objective is to throw, pin, or cause the opponent to yield by applying pressure to arm joints or the neck. Judo techniques are intended to turn an opponent’s force to one’s advantage, rather than confronting it directly. Rituals surrounding the practice of judo promote an attitude of calm readiness and confidence. Judo is the successor to jujutsu and was founded by Dr. Jigoro Kano in 1882. The basic philosophy is “use one’s potency for a good purpose” and “oneself and others share mutual prosperity.” The essence of judo theory is, “Weak but pliant can overcome strong and hard.” The purpose of judo is not merely to gain victory for victory’s sake, but to discipline one’s mind and body and cultivate one's spirituality. The idea of the spiritual formation through training of the body is rooted in a tradition of Japanse culture. The sport became the model for modern Japanese martial arts, developed from old koryu ("ancient") schools. Practitioners of judo are called "judoka." According to the International Federation of Associated Wrestling Styles (FILA), judo is one of the four main forms of amateur competitive wrestling practiced internationally today, the other three being Greco-Roman wrestling, Freestyle wrestling, and Sambo wrestling. Weaponry and the fighting arts have always occupied a place in Japanese culture. The Nihon Shoki (Chronicles of Japan, 720 C.E.) contains one of the earliest references to Japanese combative arts, descriptions of the chikara kurabe ("contests of strength") which had allegedly been conducted in even earlier times. After the tenth century, traditional fighting skills were passed from generation to generation and came to fruition with the bushi (classical warriors), who were responsible for the development of the classical martial arts. By the early sixteenth century, many martial ryu ("schools") were in existence. Some of these schools influenced the development of Kodokan Judo; to some extent, the design of the judo kata ("patterns of movement") were drawn from sumo. During the seventeenth century, Japan experienced a long period of domestic peace, and the warrior class gradually lost its predominantly martial role. The martial arts (bugai) which had originated with warriors were eclipsed by spiritual disciplines, the martial ways (budo), developed by commoners. Jujutsu is a generic term commonly applied to all Japanese systems of hand-to-hand combat in which the operator is minimally armed. For warriors, jujutsu was a secondary form of combat to support the use of a sword or other weapon in battle. As the warrior class became less important, jujutsu came to be characterized by methods of unarmed combat which were useful in civilian life. The early history of judo and that of its founder, Japanese polymath and educator Kano Jigoro (1860-1938), are inseparable. Kano was born into a distinguished family in Mikage village (now Kobe city in Hyogo prefecture). His grandfather was a self-made man, a sake brewer from Shiga prefecture in central Japan. Kano's father, Jirosaku, was not the eldest son and did not inherit the business, but became a Shinto priest and wealthy shipping agent serving the Tokugawa shogunate, under the patronage of Katsu Kaishu, a naval officer and statesman known for his role as the representative of the Tokugawa shogunate in the surrender of Edo (Tokyo). Kano was the third son, and from his childhood showed exceptional promise. When his father was called to Tokyo by the new Meiji government, Kano Jigoro accompanied him. Kano was small and frail; even in his twenties, he did not weigh more than a hundred pounds and was often picked on by bullies. However, Kano was extraordinarily perceptive, and also inquisitive about the jujutsu of his day. He first started pursuing jujutsu, at that time a flourishing art, at the age of seventeen, but had difficulty finding a teacher who would take him on as a serious student. When he was eighteen, his father secured him a place in the second incoming class of the Tokyo Imperial University, as a student of literature. He continued his efforts in martial arts, eventually gaining a referral to Hachinosuke Fukuda, a master of the Tenjin Shinyo-ryu and ancestor of noted Japanese-American judoka Keiko Fukuda (one of Kano's oldest surviving students). Fukuda is said to have emphasized technique over formal exercise, sowing the seeds of Kano's emphasis on randori, or free practice, in judo. It is said that when Kano asked Master Fukuda, during his practice session, “How do I throw my opponent down?” Master Fukuda responded, “Through much practice you will naturally understand how to do it.” Little more than a year after Kano joined Fukuda's school, Fukuda became ill and later died. Kano then became a student in another Tenjin Shinyo school, that of Masatomo Iso, who was the third successor as head of the Tenjin Shinyo school. Iso put more emphasis on formal kata than did Fukuda. Through dedication, Kano quickly earned the title shihan, or master, and became assistant instructor to Iso at the age of twenty-one. Iso also became ill, and Kano, feeling that he still had much to learn, took up another style, becoming a student of Tsunetoshi Iikubo of Kito Ryu. Like Fukuda, Iikubo encouraged free practice, and Kito Ryu placed much greater emphasis on throwing techniques than Tenjin Shinyo Ryu. Formalism and strict conduct are typical of traditional Judo. By this time, Kano was devising new techniques, such as the kata guruma (or "shoulder wheel," known as a "fireman's carry" to Western wrestlers who use a slightly different form of this technique) and uki goshi (floating hip toss). From his experience with the teachings of Tenjin Shinyo Ryu, Kano developed his katame and ate waza skills, from the Kito Ryu teachings he derived his finesse with nage waza (throwing techniques). He determined to do more than build on the techniques of Kito and Tenjin Shinyo Ryu. Full of new ideas, partially as a result of his education, Kano had in mind a major reformation of jujutsu, with techniques based on sound scientific principles, and with a focus on development of the body, mind, and character of young men in addition to development of martial prowess. At the age of twenty-two, when he was just about to finish his degree at the University, Kano took nine students from Iikubo's school to study jujutsu under him at the Eishoji Temple. Kano had not yet been accorded the title of "master" in the Kito Ryu, and Iikubo came to the temple to help teach three days a week. Though it did not receive the name until two years later, in 1884, this was the founding of the Kodokan or "place for learning the way." The word "judo" is composed of two kanji: "jū," which means gentleness, and "dō," way or road (the same character as the Chinese "tao"). Thus, Judo literally means "the gentle way," or "the way of giving way," and may also be defined as "the way of suppleness," "the way of flexibility," or "the way of adaptability." Judo takes from jujutsu ("gentle art") the principle of using one's opponent's strength against him and adapting well to changing circumstances. For example, if the attacker pushes against his opponent, he will find his opponent stepping to the side and allowing (usually with the aid of a foot to trip him up) his momentum to throw him forward. Kano saw jujutsu as a disconnected bag of tricks, and sought to unify it according to some principle. He found it in the notion of "maximum efficiency." Jujutsu techniques which relied solely on superior strength were discarded or adapted in favor of those which involved redirecting the opponent's force, throwing the opponent off balance, or making use of superior leverage. Tachi-waza (Stand-up grappling) ends and ne-waza (Ground grappling) starts once the judoka go to the ground. Judo assumes that there are two main phases of combat: The standing (tachi-waza) phase and the ground (ne-waza) phase. Each phase requires its own mostly separate techniques, strategies, randori, and conditioning; although some special training is devoted to "transitional" techniques to bridge the gap. Some judoka can be quite skilled in one phase and weak in the other, depending on their interests, although most are balanced between the two. Judo's balance between both the standing and ground phases of combat gives a judoka the ability to take down opponents who are standing up and then pin and submit them on the ground. Judo emphasizes a free-style sparring called randori as one of its main forms of training. Half the combat time is spent sparring on the ground (ne-waza), and the other half standing up (tachi-waza). Sparring, within certain safety restrictions, is considered to be much more effective than only practicing techniques, since using full strength develops the cardiovascular system and the muscles of the body, develops strategic thinking, and improves reaction time. In the standing phase, which is considered the initial phase, the opponents try to throw each other to the ground. Even though standing joint-lock and choke/strangulation submission techniques are legal in the standing phase, they are rare because they are much harder to apply in a standing position than throws are. Some judoka, however, are very skilled in combining take-downs with submissions, where a submission technique is begun standing and finished on the ground. Strikes (punches, kicks, etc.) are not allowed due to their certainty of injury, but judoka are supposed to "take them into consideration" while training by, for example, not fighting in a bent-over position for long, since this position is vulnerable to knee-strikes. The main purpose of the throwing techniques (nage waza) is to take an opponent who is standing on his feet, mobile and dangerous, down onto his back where he cannot move as effectively. Thus, the main reason for throwing the opponent is to control him and put yourself in a dominant position above him. Another reason for throwing the opponent is to shock his body by smashing him forcefully onto the ground. If a judoka executes a powerful yet fully-controlled throw, he can win a match outright on the grounds that he has displayed enough superiority to his opponent. This kind of victory is very difficult to achieve if the opponents are equally matched. Therefore points are given for lesser throws in the standing phase of combat. In real fight situations, a throw in itself can shock the opponent, and the impact can potentially knock the opponent unconscious. Footsweeps (leg trips) are used when the opponent is off-balance and, if applied at the right time, can knock down the opponent immediately. The normal footsweep is a swift swipe with the sole of the foot to the ankle of the opponent, called deashi-berai. When practicing ne-waza (Ground grappling), the judoka usually starts from their knees. In the ground phase, which is considered the secondary phase of combat, the opponents try to hold, or get the opponent to submit either by using arm locks (leg locks are not allowed due to safety regulations) or chokeholds (strangulation). Osaekomi (hold downs) are considered important since, in a real fight, the person who has control of his opponent can hit him with fists, knees, or the head. If osaekomi is held for twenty-five seconds, the person doing the pinning wins the match. The reason such a long pin is required is that it is necessary to have full control over an opponent for a long time in order to be able to hit him effectively. In a match, if a judoka pins his opponent for less than twenty-five seconds, he will get points according to the length of time held (with a minimum of ten seconds). The theory is that ten seconds would allow enough time to strike an opponent and weaken him somewhat. A pin can even result in a submission if the opponent is exhausted or his body frame cannot endure the pressure. This sometimes happens in competition when an already injured opponent has been pinned, and the pin has placed pressure on the injured area. If the person being held down has wrapped his legs around any part of his opponent's lower body or trunk, his opponent cannot get up and flee unless the person on the bottom lets go. While his legs are wrapped around his opponent, the person on the bottom can employ various attacking techniques, including strangles, arm locks, and do-jime ("body scissors"). 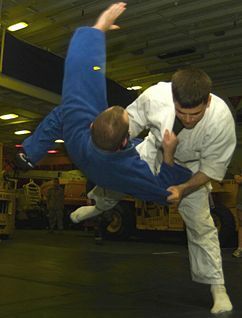 In this position, often referred to as “the guard” in English, the man on top does not have enough control over his adversary for the position to be considered osaekomi. The man on top can try to pass his opponent's legs and pin or submit him, or he may try to break out of his opponent's guard and stand up. The man on the bottom can try to submit his opponent from his guard or roll his opponent over to get on top of him. Joint locks are effective combat techniques because they enable a judoka to control his opponent through pain-compliance, or if necessary, to cause breakage of the locked joint. Joint locks on the elbow are considered safe enough to perform at nearly full-force in competition to force the submission of one's opponent. In the past, judo allowed leg locks, wrist locks, spinal locks, and various other techniques which have since been banned in competition to protect athletes' safety. It was decided that those techniques would result in many injuries to the athletes and would cause gradual deterioration of the joints. Even so, some judoka still enjoy learning them and fighting each other informally using the techniques that are banned from formal competitions, and many of these techniques are still actively used in other arts, such as Sambo and Jujutsu. Chokes/strangles are Judo's deadliest techniques. They enable the one applying the choke to force the adversary into unconsciousness and even death (though only two people have died while doing judo since 1882). The difference between a choke and a strangle is that a choke blocks the airway from the front of the neck, and a strangle cuts off the blood supply to the brain via the sides of the neck. In competition, the judoka wins the round if the opponent submits and/or fails to get out of the hold in twenty-five seconds. A properly applied judo choke can knock an opponent unconscious in three seconds. Judoka (judo practitioners) wear white cotton uniforms called judogi (which means "judo uniform" in Japanese) for practicing judo. Sometimes the word is seen shortened simply to gi ("uniform"). This judogi was created at the Kodokan, and similar uniforms were later adopted by many other martial arts. The judogi consists of white cotton drawstring pants and a white quilted cotton jacket fastened by a colored belt indicative of kyu, or dan rank. The jacket is intended to withstand the stresses of throwing and grappling, and is as a result much thicker than that of a karategi. In competition, a blue judogi is assigned to one of the two competing judoka so that judges, referees, and spectators can distinguish between the opponents more easily. In Japan, the traditional red sash (based on the flag's colors) is affixed to one judoka's belt; in Europe and North America, a colored sash is typically used for convenience in local competitions, while a blue judogi is assigned to one judoka at the regional, national, or Olympic levels where the visibility, particularly to television cameras, is more important than tradition or convenience. It should be noted that some Japanese practitioners and purists tend to look down on the use of blue judogis. While Judo includes a variety of rolls, falls, throws, pins, chokes, joint locks, and methods of percussion, the primary focus is on throwing (nage-waza, 投げ技) and groundwork (ne-waza, 寝技). Nage-waza is divided in two groups of techniques, standing techniques (tachi-waza, 立技) and sacrifice techniques (sutemi-waza, 捨身技). Standing techniques are divided into hand techniques (te-waza, 手技), hip techniques (koshi-waza, 腰技), and foot/leg techniques (ashi-waza, 足技). Sacrifice techniques are divided into those in which the thrower falls directly backwards (ma-sutemi-waza, 真捨身技) and those in which he falls onto his side (yoko-sutemi-waza, 橫捨身技). The groundwork techniques are divided into: Attacks against the joints or joint locks (kansetsu-waza, 関節技), strangleholds or chokeholds (shime-waza, 絞技), and holding or pinning techniques (osaekomi-waza, 押込技). In randori (乱取, "free practice"), judoka may attack each other with any judo throw or grappling technique. Striking techniques (called atemi-waza) such as kicking and punching, along with knife and sword techniques are retained in the kata taught to higher ranking judoka (for instance, in the kime-no-kata), but are forbidden in contest (and usually prohibited in randori), for reasons of safety. Also for reasons of safety, chokeholds, joint locking, and the sacrifice (sutemi) techniques, which can be very spectacular, are often subject to age or rank restrictions; in the United States, one must be thirteen or older to use chokeholds, and seventeen or older, or hold the rank of Shodan (first degree black belt) or higher to use arm locks. In randori and shiai (tournament) practice, when an opponent successfully executes a chokehold or joint lock, one "taps out" by tapping the mat or one's opponent at least twice in a manner that clearly indicates the submission. When this occurs, the match is over, and the tapping player has lost, but the chokehold or joint lock ceases. Because this allows a merciful exit to the match, injuries related to these holds are quite rare. Kata ("forms") are prearranged forms displaying several judo techniques. They have several purposes: To illustrate the basic principles of judo; to demonstrate the correct execution of a technique; to teach the philosophical tenets on which judo is based; to illustrate techniques that are not allowed in competition; to preserve ancient techniques that are historically important but not used anymore in contemporary judo. Knowledge of different kata is a requirement for the attainment of a higher dan. Judoka are ranked according to their skill and their knowledge of judo, the grade being reflected by belt color. There are two divisions of grades, the student grades (kyu 級) and the master grades (dan 段). Jigoro Kano was the inventor of the kyu-dan grading system that was soon adopted by other martial arts, such as karate. Each organization in a country has its own colors for belt advancement; Kano set up six kyu grades, though in many countries, there are more. The six grades are rokyu, gokyu, yonkyu, sankyu, nikyu, and ikkyu. Kano also set up a ten degree system for dan ranks, or black belts. The ten degrees are shodan, nidan, sandan, yodan, godan, rokudan, shichidan, hachidan, kudan, and judan. Kano also distinguished some of the dan rankings with specialized colors. Shodan, nidan, sandan, yodan, and godan are all simply black. Rokudan, shichidan, and hachidan were initially designed by Kano as having alternating red and white panels. Kudan and judan were initially designed by Kano as being solid red. Later, the judan belt was changed to a doubly wide version of a simple white belt, symbolizing the eternal cycle of wisdom: One can always learn more. The tenth degree, judan, has no formal regulations; the President of the Kodokan, currently Jigoro Kano's grandson, Yukimitsu Kano, decides on individuals to promote to this rank. Only fifteen individuals have been promoted to this rank by the Kodokan. On January 6, 2006, three individuals were promoted to tenth dan simultaneously, Toshiro Daigo, Ichiro Abe, and Yoshimi Osawa, the largest number to receive the honor at the same time, and the first in twenty-two years. They are also the only three who are still living. The UK and most of Europe use the following belt grading colors: White, yellow, orange, green, blue, brown, and then black. Some European countries additionally use a red belt to signify a complete beginner. In Japan, all adult kyu grades wear either white or brown belts. In the U.S., the colors run white, yellow, orange, green, blue, purple, brown, and then black, but women's ranks sometimes bypass blue or purple. All dan grades may wear the black belt; sixth- through eighth- dans may alternately wear a red-and-white belt, while those ranked ninth-dan and above may wear a solid red belt. Some countries also use colored tips on belts, to indicate junior age groups. Historically, a woman's belt had a white stripe at its center in some countries. In some countries, the nine colors run from gray through white, light blue, blue, yellow, orange, green, purple, and brown. The Kodokan Judo syllabus also leaves room for an eleventh dan (although it has never been achieved). The judoka who attained this grade would wear a white belt of double width. In most Western countries, judoka have to pass an exam which is normally assessed by the sensei (teacher) within the dojo (judo school). Judoka may also have to compete in a grading competition against people of a similar grade. If necessary for the particular rank they are advancing to, they may also be tested in kata, a display of prearranged forms or techniques. Once all parts of the exam have been completed it is possible for a judoka to be promoted. The dan (black belt) ranks are awarded after doing an exam supervised by independent judges of the national judo association. However, some have been awarded black belts outside of this association. Examples include Hori Akioya from Bogota, Colombia, who was awarded a black belt after his death in a judo match, and student prodigy Joseph Picthall from the United States who was awarded a black belt after defeating a renowned Grand Master in a tournament held in Seattle, Washington, in 2000. Jigoro Kano's Kodokan Judo (講道館) is not the only style of judo. Kano took the name judo from Jikishin Ryu Judo, which is an older school not seen outside of Japan. A sub-style of Kodokan Judo that developed in Japanese inter-scholastic competition is known as Kosen Judo (高專柔道) with the same range of techniques but greater latitude permitted for ne-waza (ground technique). Teaching in France, Mikonosuke Kawaishi developed an alternative approach to instruction that continued to teach many techniques banned in modern competition. In Austria, Julius Fleck and others developed a system of throwing intended to extend judo, which they called Judo-do. Mitsuyo Maeda introduced Judo to Brazil in the early twentieth century. At this time, ground fighting (newaza) was very popular and not yet limited by the rules. He taught Judo to Carlos Gracie (1902-94) and others in Brazil. The terms Judo and Jiu-jitsu were at that time interchangeable. Brazilian Jiu-Jitsu ignored later changes in international judo rules which added emphasis to the standing phase of the fight, and thus remains a distinctive form of judo to this day. Although a fully featured martial art, judo has also developed as a sport. Judo became an Olympic sport for men in 1964, and, through the persistence of an American woman, Rusty Kanokogi, and many others, for women as well in 1988. Popular legend insists that the men's judo event in 1964, was a demonstration event, but according to Michel Brousse, official researcher and historian for the International Judo Federation, Judo was in fact an official sport in the 1964 games. Thanks to Dutchman Anton Geesink, who won the gold medal in the All Categories division, defeating Aiko Kaminaga (Japan) judo lost the image of being "Japanese only" and became an international sport. The women's event was a demonstration event in 1988, and became an official medal event four years later. Men and women compete separately (although they often train together), and there are several weight divisions. The object in a judo match is to either throw your opponent to the ground flat on his back, to pin him to the ground on his back, or to force him to submit using a choke or an arm lock. This will score an ippon (一本), a full point that wins the match. Anything else, such as landing your opponent on the hip or shoulder from a throw, will be waza-ari (技有), yuko (有効), or koka (効果) (waza-ari being the highest of the three, koka the lowest) or even no score. Technically speaking, a waza-ari is a half-point, two of which will earn the match. Yuko and kokas are not fractional points in that they do not accumulate to equal a waza-ari or ippon—in fact, a waza-ari beats any number of yukos and a yuko beats any number of kokas. 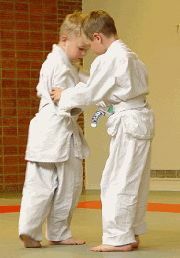 Rather, they are used as tiebreakers if the match ends before an ippon is scored. At match end, if one player has scored a waza-ari and the other has not, the player with the waza-ari wins, but if they are equal in that regard (both with zero or one) yukos are used to break the tie. If they are also equal in yukos, kokas break the tie. Finally, if both players have identical scores, the match is resolved by having the contestants continue fighting in a sudden death overtime called the Golden Score period, where the first contestant to get any score wins. If there is no score during this period, then the decision (majority vote) of the referee and two corner judges is used. After a throw occurs (whether or not it is scored), combat may continue on the ground. Pinning an opponent, with both shoulders on the mat, for 25 seconds (20 if one has previously scored a waza-ari, since two half-points will complete your ippon) results in an ippon. An automatic ippon is also granted when one's opponent submits (which frequently occurs when strangleholds or arm locks are used). If there is no ippon, the one with the highest score wins. Penalties may be given for being inactive during the match or using illegal techniques, and fighting must be stopped if a participant is outside the designated area on the mat (tatami). If the referee and judges need to discuss something during groundwork, the referee will call sonomama (which means "do not move") and both fighters must stop in the position they are in. When they are done, the referee says yoshi and the match continues. All scores and penalties are given by the referee. The judges can make a decision to change the score or penalty given by the referee. Despite the literal meaning of "judo" being "the gentle way," competition judo is one the roughest and most demanding of sports. Regulation time in a World Championship or Olympic match is only five minutes, but will leave participants exhausted; in the event of a tie, matches may also proceed to an overtime phase which can last as long as regulation time. Because competition judo does not contain the kicking and punching so common to other martial arts, judo is often portrayed as friendlier than, for instance, karate (although some forms of karate emphasize the control of character and aggression). Proponents believe this contributes to judo being underrated as a method of self-defense since advanced kata do contain defenses against kicking, punching, and armed techniques, although they are mainly practiced by black belts. In addition, while throws executed with proper break falls on soft mats can seem light and graceful, their more practical application on a hard surface (and potentially with greater intent to harm) could be very dangerous. Even in the controlled environments of a match or dojo training session, injuries can easily occur due to a lapse in focus or overzealous application of a technique. Anecdotal evidence suggests that judo techniques are often effective in self-defense situations. Due to their knowledge in grappling (ne-waza) and standing-grappling (tachi-waza), various accomplished judo practitioners have also competed in "mixed martial arts" matches. Fedor Emelianenko is Pride Fighting Championships's current heavyweight champion and consistently ranked the world's best heavyweight mixed martial arts fighter. Hidehiko Yoshida, an Olympic gold medalist in 1992 and World Judo Champion in 1999, is well-known in Pride as well. Karo Parisyan, an Armenian-born judoka now fighting in the Ultimate Fighting Championship, has demonstrated the application of judo techniques to mixed martial arts in the United States. It should be noted that the ability to throw an opponent to his back and apply a pinning technique is of enormous importance in these kinds of competitions, as is the ability to finish off a downed opponent with strikes or a submission-move. Judo, uniquely among combat sports, puts equal emphasis on the initial throwing and the final pinning and submitting phases of combat, ideally enabling practitioners to dominate grappling-fights from the start. The international organization of judo is the IJF, or the International Judo Federation. In the U.S., there are several different national organizations. One is USA Judo, which also has state organizations which host state tournaments and other judo related activities (USA Judo is the National Governing Body to the United States Olympic Committee). The other national organizations are USJF, United States Judo Federation, and USJA, United States Judo Association. Each national organization in the U.S. has its own promotion requirements, but they still have the same belt rank system. USJF and USJA are founding members of USA Judo with members often having dual membership. In Great Britain, the British Judo Association (BJA) is the largest judo association and the only one affiliated to the IJF. Judo clubs can also be administered by the British Judo Council (BJC), which is popular in the north of England. Some minor judo administrations exist, such as the BJC-MAC (British Judo Council-Martial Arts Circle). This page was last modified on 13 June 2018, at 15:01.